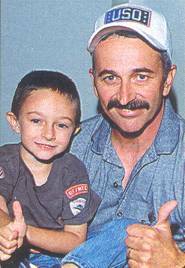 Aaron Tippin got a different kind of double shot at the Forth Campbell, KY, army base before heading to Afghanistan for his Thanksgiving USO tour. 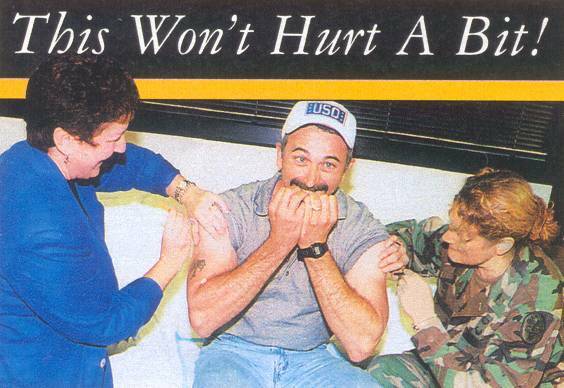 Rugged Aaron pretended to cower in fear at the prospect of five immunization shots -- but staffers Kimberely Matthews and Heidi Warrington obviously calmed him down. Afterward, Aaron and son Teddy gave the thumbs-up to a clean bill of health.